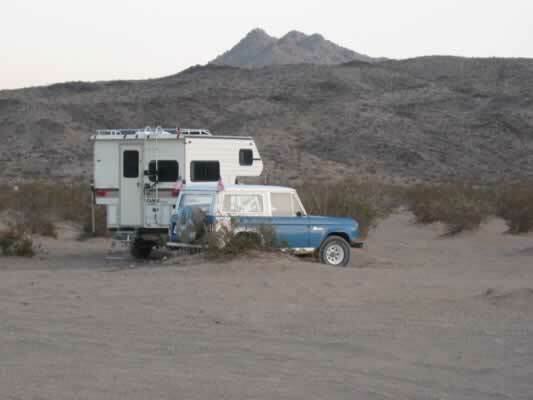 Thanks to Google Maps we were able to find this remote place about 30 miles east of Victorville. 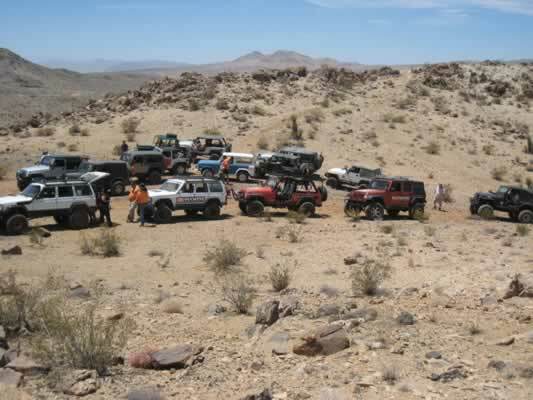 The Anderson Dry Lake is part of the Johnson Valley OHV area. Based on the desert environment, somewhere in its family tree it is related to Death Valley. 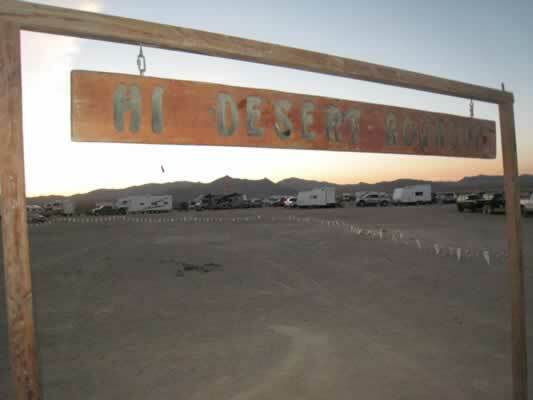 It is easy to find a level camping spot on a dry lake and we breezed through the safety check and registration. There were four runs to choose from that ranged from easy to very difficult. I picked a "moderate" level and kept my fingers crossed. I lined up early for the run to hopefully get a position toward the front. 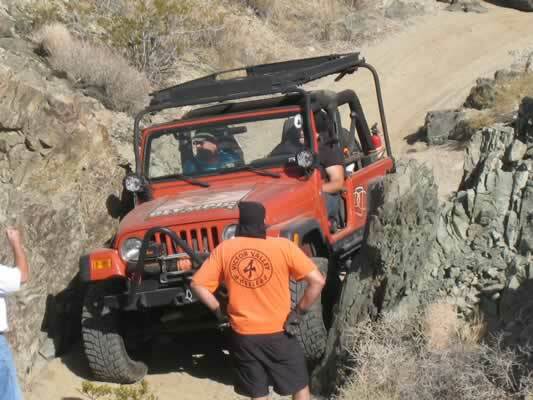 Sometimes the trail gets pretty chewed up as the vehicles traverse the obstacles and it gets more difficult if you are in the back of the pack. 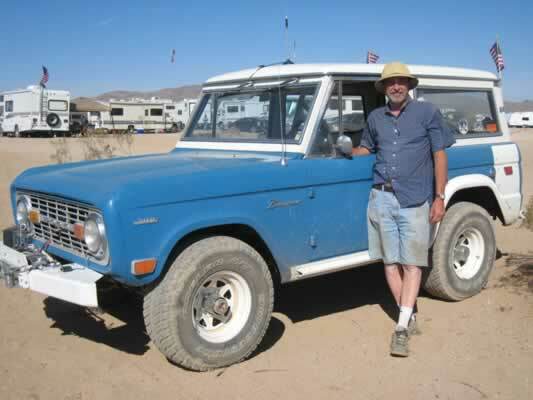 Fifteen vehicles lined up for this run, fourteen Jeeps and one non-Jeep (my 1969 Bronco). The optimum tire pressure is based on the tire size, vehicle weight and terrain. I have always subscribed to the K.I.S.S. system (Keep It Simple Stupid) so I generally just leave my 32 inch tires at 25 psi at all times. I am sure I could prove this is the optimum tire pressure if I could ever find my college slide rule (pre-calculator days). After observing the run leader's very low tire pressure, I got intimidated, scratched my head, and lowered my tire pressure to 22 psi in the front and 20 in the rear. Fortunately my trusted navigator/co-pilot (my wife) came along to help keep me out of trouble. 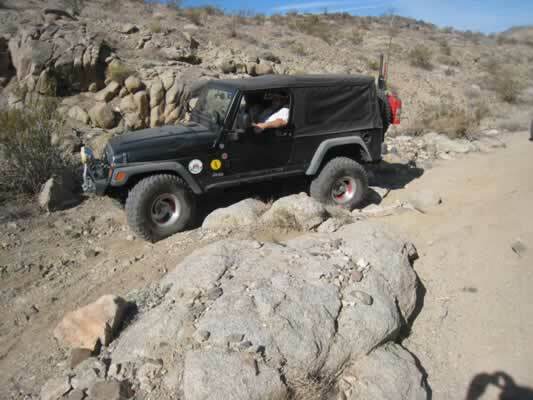 After my boo-boo a couple months ago at the Desert Safari, when I got stuck because I was in two wheel drive, she continually asks me if I am "in the right gear." As we approached the first obstacle, she asked that same question. I very over-confidently assured her that we were "good to go" after checking the shift levers (4wd low range and low gear). Almost immediately my tires spun and I was stopped, I backed up and hit it again, stopped again. I thought I had a transfer case problem so I put it in 4WD high range, same result. 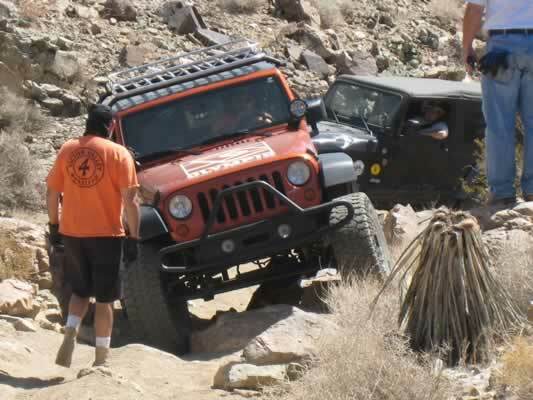 This was getting embarrassing, it was not a real difficult obstacle and I am surrounded by 14 JEEPS. I backed up again and with a great amount of speed I practically flew over the rock pile. If we had not had our seat belts tightly buckled we could have had neck injuries from hitting our heads on the roof. As the run leader walked back to spot people over the rocks, I got out and checked my locking hubs. Sure enough, I had only locked one so I was effectively in two wheel drive, again. We only had one other problem after that, but whenever my wife asked if I was in the "right gear", my only response thereafter was a sheepishly "I think so." After numerous more challenging obstacles, we finally came to about a three foot vertical drop. I watched the Jeep in front of me drag his rocker panels over the ledge, to be shortly followed by his back bumper scraping down the face. I suggested that some more rocks be placed at the bottom to cushion the drop, and they looked at me like I was crazy. I asked about a bypass and they pointed to a very steep hill with a sharp turn at the top. I then thought about asking for a bypass to the bypass, but figured that I had already adequately embarrassed myself. So I took the bypass, with a great amount of speed, while the 14 Jeeps slid over the cliff. We all got back to camp safely and there were no flat tires or mechanical problems. The leader and his team members did a great job getting everybody through the obstacles and we all had a fun time. Comfortably back at camp I thought I was beginning to hallucinate. I began to hear a ding-aling noise that I had not heard in 40 years. It sounded like an ice cream truck. 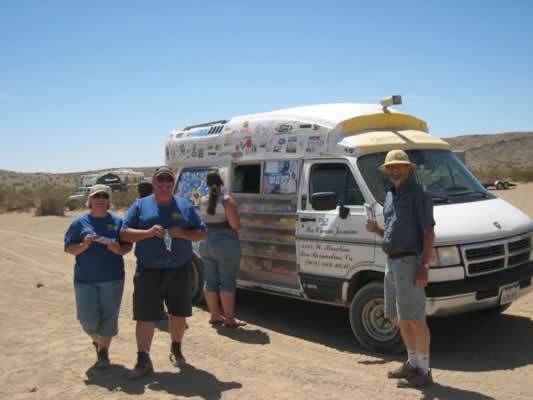 Sure enough, right there in the middle of the Mojave desert, was an ice cream truck. I ran over to stop him and bought two ice creams (one for the navigator). WOW, the frosting on the cake, it doesn't get any better than that! Mike is a member of the Eastern Sierra 4WD Club (easternsierra4wdclub.com).